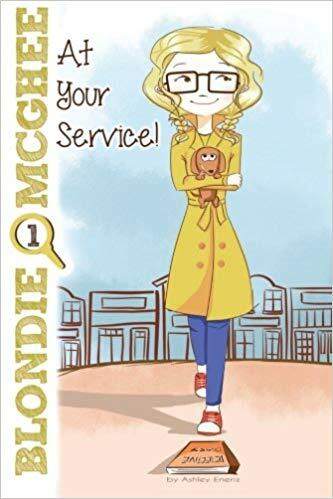 The first book in a detective series based on fourth grade Graham Elementary student Blondie McGhee. Blondie became interested in mysteries when her Grandmother gave her a detective kit when she was in third grade. As the story opens Blondie is excited to begin fourth grade. She is eager to recruit students at the school who have a mystery to solve. One week passes by with no case in site. Blondie fears she has not advertised enough so she stands on the lunch table and offers her detective services to all the students. All seem to ignore her, except Owen Thomas who claims there is a mysterious noise coming from the janitor’s closet. Blondie makes an excuse to leave class and investigates. She is horrified when Mike, a friend of Owen, is hiding inside dressed as a monster. The three students are in big trouble; Blondie is a laughingstock. Blondie feels a little better after her mother shares her own embarrassing school story, but Blondie is reluctant about returning to school. She is shocked when Owen comes to her door to apologize and beg her help to solve a real mystery. Blondie is back on the case of the Tuesday Food Fight. She methodically follows the clues until this genuine mystery is solved. Blondie wins back her credibility and reputation. There will be many more mysteries to solve in the next books of the series. The author recommends her series for girls in the nine to twelve age range. I think boys will enjoy them as well. The book-length of fewer than one hundred pages and adorable black and white illustrations allow the stories to appeal to reluctant readers and advanced beginning readers as well. Detective story fans mark this series as one to add to your collection. We love detective stories! We’ll have to check this one out! Thanks for sharing this at Booknificent Thursday on Mommynificent.com! Covers a lot of middle-grade peer issues. I especially like that the author combines humor with a clever plot line.